It has all the makings of a suspenseful thriller: Nuclear material, possibly procured from technology in Russian hospitals, is smuggled into the small Eastern European nation of Moldova, where gangsters offer it for sale on the black market. Their preferred customer? The Islamic State*. This is where the hero steps in. In real life, that hero is less James Bond and more Blake Pritchett—Alabama native, UAB graduate, and a program manager for the Export Control and Related Border Security program in the U.S. Department of State’s Bureau of International Security and Nonproliferation. That means he’s part of a global team helping to box in bad guys. “Strategic trade controls are national and international frameworks that can prevent terrorists and rogue governments from developing nuclear, biological, and chemical weapons,” Pritchett (pictured above) explains. “We help partner governments build laws and institutions to regulate trade in sensitive items—those with legitimate civilian uses that also could be used in weapons of mass destruction (WMD)—to interdict smuggled goods and contraband at borders, and to prosecute violations. By building the capacity of our partners to stop proliferation, we reduce the chances that these dangerous weapons can be used against Americans or our allies.” Pritchett’s efforts helped Iraq and its neighbors reestablish border controls at key ports of entry in order to strengthen trade and economic growth and strangle the Islamic State’s access to threatening weapons and technology. In 2014, his group laid the groundwork for American support, in the form of non-lethal equipment and training, for Ukrainian border guards following Russian incursions into the country. Terrorism and WMD weren’t on Pritchett’s mind when he left rural Marengo County for Birmingham’s bright lights in 1998. What sparked his interest in foreign affairs and public service was a semester in UAB’s Model Arab League—part of a continuing national program that challenges students to think like Middle East diplomats—around 9/11. Next came internships with Alabama Congressman Earl Hilliard in Washington, D.C., and Birmingham Mayor Bernard Kincaid. At City Hall, Pritchett worked with the Sister Cities program, meeting government, business, and student representatives from Birmingham’s counterparts in China, Japan, and Ukraine. The experience illustrated the power of interpersonal relationships to connect communities, cultures, and continents, he says. Pritchett’s first federal job after graduation was with the Defense Threat Reduction Agency (DTRA), a Department of Defense group dedicated to combating WMD. First in Kazakhstan, and then in Azerbaijan, where he led the DTRA office, Pritchett helped government leaders strengthen maritime security to prevent the flow of WMD in the Caspian Sea. He also worked on nuclear security at a former Soviet test site and joined efforts to control pathogens and diseases that could be weaponized against Americans. 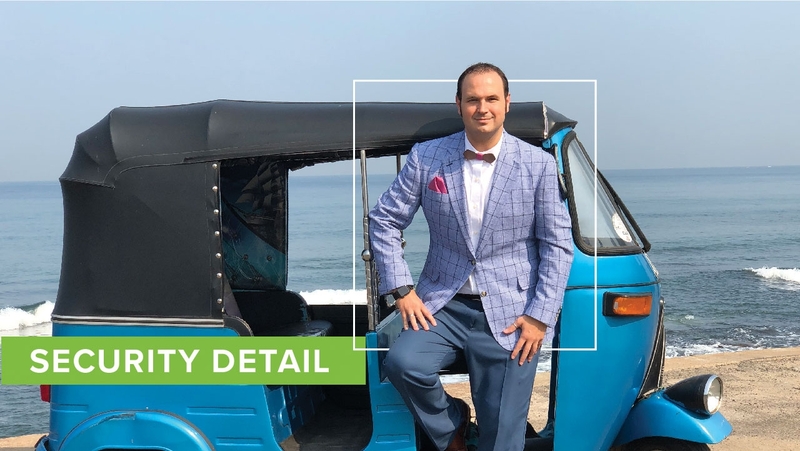 Today, Pritchett connects with colleagues and partners from his office in the island nation of Sri Lanka, where his wife, Joanna, whom he met in Azerbaijan, is a State Department foreign-service officer. His daily task list resembles that of most managers: identifying goals, developing strategies and schedules, and monitoring performance. But diplomacy is key. For two years Pritchett crisscrossed the Middle East to meet partners in person; now he travels around Africa. “I might spend time at a seaport, airport, or border crossing; discuss ways to identify sensitive goods with customs officers; and meet with representatives from economic and foreign ministries,” he says. * This is a true story. The FBI and Moldovan authorities have repeatedly thwarted such attempts. • Discover all the opportunities for learning and experience in the College of Arts and Sciences Department of Political Science and Public Administration. • Help shape the next generation of leaders for Alabama and America through a gift to the department.